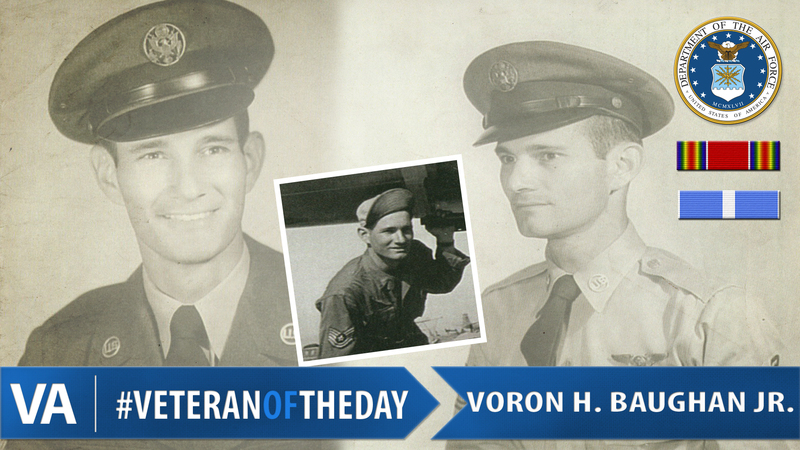 Today’s #VeteranOfTheDay is Army Air Corps Veteran Voron Baughan, Jr.
Voron joined the service in 1943 at the age of 18. After training to be a gunner engineer, Voron went to Biak Island, New Guinea where he was assigned to the 90th Bomb Group Heavy with the 321st Bomb Squadron. When World War II ended, he flew throughout Japan, the Philippines, Guam, and anywhere else he was needed with troops and supplies. In January 1950, Voron went to Okinawa, Japan, as a member of a support squadron. When the Korean War broke out in June, he was sent to Korea before being called out to Japan to be an aerial gunner. In Japan, Voron went on missions nearly every day, sometimes completing two in one day. In 1952, Voron was discharged. He reenlisted nearly immediately in the Air Force and served at different bases in the United States, including in Alaska and New York. He retired in 1965 after 22 years of service. Thank you for your service, Voron!